It's been called one of the most "widespread miscarriages of justice in the UK this century", yet not many people know about it. Between 2000 and around 2013, a hundreds of subpostmasters running branch Post Offices fell foul of its point of sale and accounting IT system and an intransigent employer. They found themselves prosecuted for fraud, theft or false accounting. Often with little evidence. Some subpostmasters were sent to prison, others lost their livelihoods and reputations. Some were given a criminal record and financially ruined. Some lost their minds due to the stress and shame. One man, called Alan Bates, decided to fight back. He was sacked from his job as Postmaster at Craig-y-don Post Office in Llandudno, North Wales. He had suffered ongoing inexplicable computer-generated losses and questioned why he should keep repaying them. He asked the Post Office for an investigation into the losses or the relevant auditing tools to interrogate the Horizon software. These requests were typically refused or ignored. Alan lost his livelihood and the retirement savings he and his wife had invested in their Post Office business. Alan started a campaign which became the Justice for Subpostmasters Alliance. Now more than 500 subpostmasters and former Post Office employees are taking the Post Office to the High Court in a class action. The trial starts on 5 November 2018. 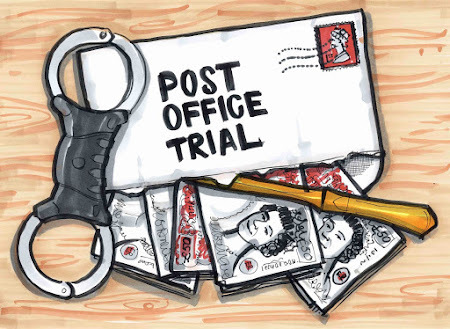 This trial could cost the Post Office tens of millions of pounds in damages. Equally, the Post Office could be vindicated on every count. But the detail which will come out over the course of 20 days will be fascinating. We will hear stories of ordinary people caught up in a vicious and unrelenting process which ruined them. Maybe they deserved it. Either way, these peoples' stories deserve to be reported. I would be immensely grateful if you could help me be there for every single twist and turn of the trial. If I reach my £3000 target I will be able to attend court for each of the 20 days in November it is due to sit. I will compile daily court reports and make them freely available on my blog and via social media channels. I will also publish regular updates in the run up to the trial. The aim is to tell the story fairly, honestly and accurately. Backers will, of course, get more than the publicly available stuff. I'm not ploughing a lone furrow. Computer Weekly - the publication which first broke this story back in 2009 - returns to it on a regular basis. Private Eye has championed it since 2011, and I have been involved in a number of broadcast reports, but I don't know of any outlet or journalist who has signalled an intention to cover every day of the forthcoming trial. That is crucial. We all know the devil is in the detail, and without the commitment to be there every day, the detail could be missed. Although various MPs have called two parliamentary debates, set up a select committee inquiry and asked questions in the House, the wider public don't really know what's been happening over the last 18 years. This is your opportunity to fund some proper public interest journalism. To help tell the story of the ordinary people who thought they were doing the right thing, but who ended up losing everything. Anything you can chuck in the bucket would be gratefully received, but do take a look at the rewards too. If you or your organisation can afford it, there are lots of fun things to be had in return. The £3000 target for reporting this trial is a minimum. If I raise it, I will still make a loss - so please do think about back the project even if you see it has reached its target. Your rewards will still be honoured! The kickstarter will begin on 1 September and run until 15 October. If you want to know more about this story click here.